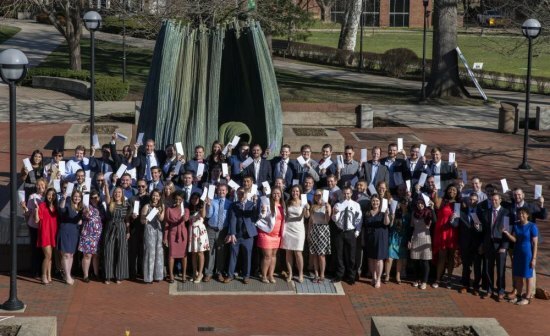 HUNTINGTON, W.Va. – Sixty-two medical students from the[jcesom.marshall.edu]Marshall University [jcesom.marshall.edu]Joan C. Edwards School of Medicine found out Friday at noon during the annual Match Day event where they will train for the next three to seven years. Coordinated by the National Residency Matching Program (NRMP), the main residency match process uses a complicated algorithm that pairs the preferences of applicants with the preferences of residency programs, resulting in a best result for graduating students. Marshall students, along with medical students from around the world, all opened their match letters at the same date and time. More than 53 percent matched into primary care residencies, which are identified in West Virginia as family medicine, internal medicine, internal medicine/pediatrics, pediatrics and obstetrics/gynecology. Other students were accepted into anesthesiology, dermatology, emergency medicine, general surgery, neurology, orthopaedic surgery, psychiatry and radiology programs. One student also matched in the military match that occurred in late 2018. Across the country, this is the largest match on record, according to the NRMP, with 44,600 registered applicants and more than 35,000 positions offered. View the complete match list for the School of Medicine’s Class of 2019 at https://jcesom.marshall.edu/media/57789/2019-match.pdf.